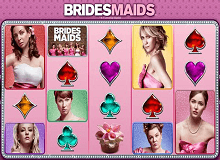 If you love watching the film Bridesmaids, then you will certainly feel worthy playing Bridesmaids slots powered by Microgaming which was released in 2015. Besides being part of the fun, you are entitled to fantastic prizes including bonuses, scattered cupcakes, free spins, and a jackpot amount of up to 105,000 coins. While at it, take note of the unique game theme to understand what it takes to create a slot with beautiful visuals and soundtracks that sound like music to your ears. 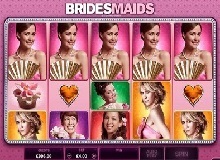 Whether you are playing for fun or for real money, Bridesmaids slot allows you to meet and greet the characters including Lillian, Annie, Helen, Megan, Rita, and Becca. Besides hooking you up with prizes, these talented women will ensure you get a good laugh thanks to some funny clips of the film. Get prepared to come across unique bonus rounds as you keep interacting with them. But, how will you achieve all that? The rules on this one, are pretty simple. To start with, you need to place your coin stake with as little as 0.40 to 60 coins using either the plus or minus buttons. This should cover all the 40 play lines. 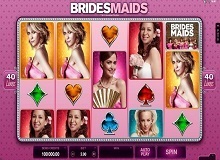 If you are ready to play Bridesmaids for real money, press the “Spin” button to set the reels to motion. Also, you have the option of switching to Autoplay if you want uninterrupted spinning experience. One thing about the Bridesmaids free slot is the unique Bonus experience. With an RTP of 96.71%, the game allows you to indulge in scattered cupcakes since they play two roles; they are multipliers and a Wheel bonus round as well. Anytime you land on it, your winnings will be multiplied 200 times. 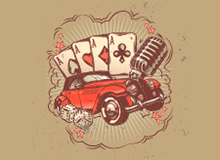 The Wheel Bonus offers you the chance to win other bonuses that include 10 friendship free spins along with piled wilds, and a boutique bonus which requires you to make the right combination to score highly. As the name suggests, magic moments offers you a chance to pick ten moments that you consider magical to win more prizes. The Cupcake bonus is also known as the pick-me game that allows you to select between two times or three times multipliers or two extra prize-giving options. Obeying rules as indicated on the gameplay seems like a good idea but you need more. Paying attention to high-value symbols will make you smile all the way to the bank. Concentrate on both wilds and scatter symbols to increase your chances of winning big. You can also increase your chances of winnings thanks to the Bridesmaids icon which acts as the wild symbol. These symbols will replace any other apart from the scatter which is represented by the cupcake. How does it feel to be part of a bridal team with lots of fabulous prizes? It would be pretty fantastic to be on the lineup to watch your loved tie the knot to the love of her life. This slot will increase your experience in a marriage ceremony; something anyone wants to be a part of. Think of it as your biggest breakthrough since you joined the gambling world and be player that knows how to be patient even when things go south. Due to an increase in demand for virtual gambling, spinners will have the chance to play using their personal computers, tablets or mobile gadgets. The game’s interface remains the same and it is protected by powerful security tools that promote cheat-free services. To get the best online slots, you can select games offered by the same provider. Again, it is important to adhere to the rules before you download the application. Terms and conditions apply to people who reside in gambling-restricted countries. Part of the real gaming experience has to do with your ability to make new friends. Like the movie, these maids will give a warm embrace and reward you for your undying loyalty. Maximize on each icon you come across so that you can start winning good money. The cupcakes and the maids are the main icons which randomly appear to increase your balance up to 200 times. And of course, you will love the visuals and sound effects as you get to meet them online. So, decide whether you want to play Bridesmaids game for free or real cash.